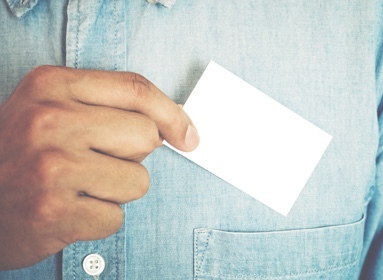 First – What is a business card? Custom printed business cards are an essential tool in business communication. Business cards are the primary way to promote your business through the distribution of contact information. Business cards traditionally come in the standard size of 2 x 3-1/2 and are commonly printed on 100# card stock. Second – Designing your business cards. When designing your custom business card follow a design technique called symmetry, which is combining graphics and text to create balance in the design. This balance allows the viewer’s eyes to flow from one point to another on the business card causing movement. A good design will contribute balance and movement in order to direct the viewer subconsciously to read and react to the business card. Tip: Keep it simple. Limit your card to only one or two graphics; any more could be distracting from the overall purpose of the business card. Don’t forget the essential information: Name, Email, Address, Website, Phone number, Fax number, and Cell phone number. The whole reason for a business card is to communicate to a customer your contact information. Call Kendall Printing for all your business card needs!